Australian guitarist Orianthi is hot and she is highly talented. The good news is she is also set to play a concert at KL Live, Jalan Sultan Ismail in Kuala Lumpur on Aug 4. At 24-year-old Adelaide-born Orianthi (real name Orianthi Panagaris) has already experienced what most aspiring musicians only dream of. She’s opened for her hero, Steve Vai, backed an American Idol, Carrie Underwood, traded solos with a legend, Carlos Santana and shared the stage with the King of Pop, Michael Jackson. This female rocker is best known for being the late Jackson’s lead guitarist for his comeback concert series, “This Is It” at the O2 Arena in London, which didn’t happen because of the pop superstar’s death. She appears prominently in the “This Is It” concert film. However with her debut album “Believe”, Orianthi has stepped out as a bankable artiste in her own right. Her thunderous, hook and riff driven debut has given her radio hits like “According to You,” Suffocated”, “Think Like A Man” and “Shut Up And Kiss Me”. 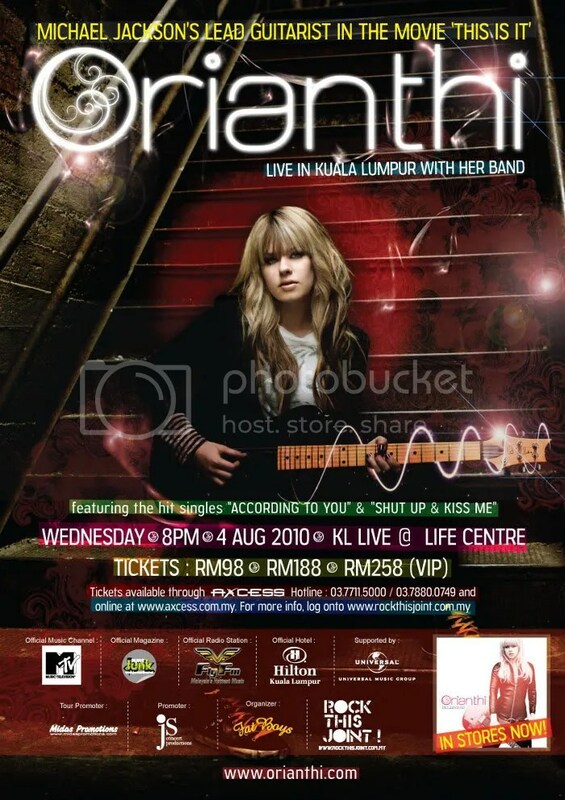 Orianthi at KL Live on Aug 5 is ticketed at RM98, RM188 (rock zone) & RM258 (VIP upper tier). For more details, browse (rockthisjoint.com.my) and (axcess.com.my). Concert hotline 03-7880-0749. Wow! Another guitarist? Female?! WOW!! And just 1 day before Slash. So Slash or Orianthi? I think Slash. He’s always been my favourite! !